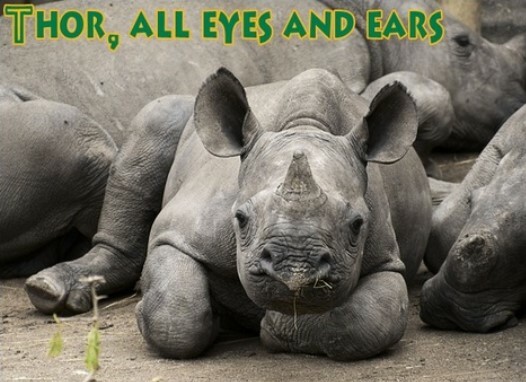 Baby Rhino Thor at Baby Rhino Rescue | Adopt and Donate Now! Thor came to Care for Wild Africa in August 2014. He was orphaned and found in the Talamati area of the Kruger National Park where his mother had been poached. His mother was killed very brutally and Thor was traumatized by what he witnessed. Thor was transported to the sanctuary via helicopter and “died” four times en route. C4WA staff had to shock him back to life. The nature of a black rhino is very different from a white rhino. Thor was a typical black rhino; he was initially very aggressive, tetchy and fast moving and even chased Sam, his handler, up a fence. He was also depressed and appeared to have nightmares, waking up shaking. Just when Thor was beginning to acclimatize to his new environment, he went down suddenly. He had to be placed in a crate and watched 24 hours a day. It seemed very touch and go, but Petronel was not prepared to give up the fight. She stayed by his side, giving him support and love. When he was out of danger, he was placed in a night pen alone. All he did was sleep. It was as though he was slowly restoring himself from the deep trauma he had been in. It took a few weeks before he was even able to venture beyond the doors of his nightpen. Slowly he regained his confidence. It seemed that he understood, after all the loving care, that he was in a safe, protective environment and he started to make real progress. He was also no longer aggressive and became very easy to handle. Thor is very sturdy now, has put on weight and is almost unrecognizable from the frail, traumatized young rhino that arrived. He loves to browse on acacia branches and thorns, using his lip like a dexterous finger. He eats the equivalent of a small tree per day. Thor has moved to a beautiful, new enclosure which he shares with his best friends River and Tyson. The three rhinos do everything together. 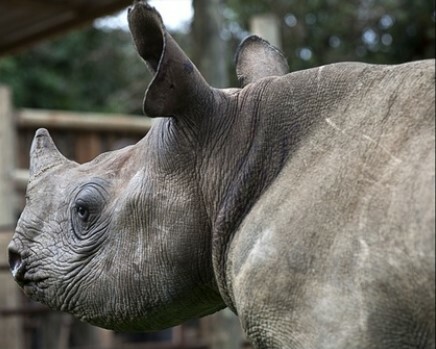 Thor is the first rhino in the mud bath and loves nothing more than moving around in the lush green grass in the outside area, then resting under the mango trees all afternoon, before being brought back for his milk bottle at the end of the day.